AR & VR technology gives us the power to go anywhere, be anyone and do almost anything our minds can conjure up! Virtual Reality (VR) is a magic blindfold. Wearing some kind of headset (or HMD as we say in the biz) the user is completely immersed into an interactive digital world with no view of their physical surrounds. Think being inside a video game or movie. Augmented Reality (AR) on the other hand places digital assets over the real world. Think Pokemon GO. The user can still see the physical world around them while also seeing and interacting with the digital assets included in the AR experience. 360° video is video content captured in a sphere (or half sphere in the case of 180° video). The viewer has the ability to ‘look around’ creating the feeling as if he or she is in the location where the shooting took place. When it comes to virtual reality headsets (a required component to experience the technology) you have two basic levels of immersive power to choose from: tethered and standalone systems. Tethered VR is currently the holy grail of virtual experiences. These systems require a high powered computer to drive the experience you see inside the headset. The term tethered refers ‘tethered to a computer’, even though most of the high-end systems now offer some kind of ‘wireless’ connection to the computer. Examples include: HTC Vive & Vive Pro, Oculus Rift & PlayStation VR. Standalone systems are just the opposite. They are a complete all-in-one system that does not require an outside processing or power source (ie. a computer or phone). Everything you need is contained right there inside the headset and/or controllers. Examples include: Oculus GO, HTC Vive Focus and Samsung Gear VR. So why would anyone buy a tethered system when you can get a complete stand-alone system that doesn’t require a fancy PC? The simple answer, quality. High-end VR experiences require a ton of processing power. Standalone systems are starting to catch up, but they still have a ways to go in order to match the power of PC powered VR. Regardless, both systems have plenty of power to fool your mind into thinking you are somewhere (or someone) else. DoF?...What does that even mean? The last big difference between different VR systems is 3DoF vs 6DoF. DoF is short for 'degrees of freedom’. In other words, how many directions can you move while in the VR headset. 3DoF systems only track the users head movement in two planes; up down, left right. They are great for seated VR experiences, games or watching 360 videos. 6DoF systems, on the other hand, allow users the freedom to actually walk around, jump, squat, etc, inside of a predetermined ‘play space’. These systems can create a strong sense of ‘presence’ in the user. Most standalone systems are 3DoF and most tethered systems are 6DoF, but that also is changing quickly. Both Oculus and HTC (the two biggest names in the industry) have 6DoF standalone systems coming to market in 2019. There are two general levels of augmented reality experiences as well; mobile AR and wearable AR. Both technologies offer similar experiences, layering digital assets over the real world, but are delivered in two distinctly different mediums. Users interact with mobile AR experiences through the camera on there mobile phone or tablet. (The GIF above is a good example.) Point your phone at the ground, a product or an AR trigger, and voila! You’re digital experience awaits. Mobile AR technology has advanced rapidly in the past 12 months allowing developers to produce some truly amazing applications. ‘See’ a piece of furniture in your living room before you buy, try-on new clothing from the comfort of your bedroom or get step-by-step direction on how to install that new alternator on your car. Don’t be surprised if you start seeing this technology crop up in more and more places. Wearable AR is the future! Yes, you can experience this technology right now with products like Microsoft's HoloLens and Magic Leaps One AR headset, however these products are still relatively expensive and have limited practical applications. Wearable AR is augmented reality technology you ‘wear’ on your head or face. Similar to mobile-based experiences, wearables allow the users to ‘see’ digital assets over the real world, however that is where the similarities stop. Wearable AR headsets contain a plethora of sensors and technologies not available on mobile devices (although that is also starting to change. The iPhone X for instance can perform most of the same feats as mentioned next). These headsets can digitally map their surroundings in real time, read hand and eye gestures, as well as detect depth and distance, all without the user having to touch the actual device. Some experts believe, as these headsets become more lightweight, more powerful, and more fashionable, they will be as ubiquitous as the modern day smartphone. 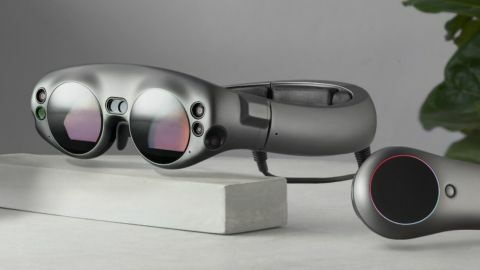 Why are people excited about XR technology? Immersive technology (XR) is the stuff of science fiction books in the flesh. Want to be a space pirate for a day and fend off alien intruders from taking your stash? No problem. Do you need to train 1,000 employees across a global business on a new piece of equipment before lunch? You can do that too! How about meditating on a beach in Tahiti without ever leaving the comfort of your living room. Simple. XR technology gives us the power to go anywhere, be anyone and do almost anything your mind can conjure up. And it’s all just getting started. Interested in learning more about how you can use XR technology to advance your brand or business? Give us a call today, we’re always happy to chat! Donuts included.